Earlier this month we agreed a lease with HS2 to run Cuttle Mill as a carp fishery until such time as they want it back to build their new railway line. HS2 had compulsorily purchased the property a couple of years ago and since, I believe, have moved the line a 100m further away from the property, so it is possible it won’t be affected at all. In the meantime, we have an iconic carp fishery, with a beautiful mill house built into the dam. Currently we are selling day tickets and a ‘two days and a night’ option during the week. If you are interested in fishing here, you can book and pay for day tickets up to a month in advance through the website. Just as we let the fishing in France by the week, we are considering letting the fishery by the week to a team who would then also have the house, which is rather more comfortable than our French offerings! If you have ever thought about sitting up in bed and looking out across a carp pool then this could be your big chance! I am testing the water at the moment. If anybody is interested in taking the fishery exclusively either for a week or possibly a shorter period then I would be pleased to hear from you so we can tailor an offer. If you simply want to rent the house and fish a day ticket then that could work as well. If you are interested in discussing options then best to e mail me with your contact info and I will call you back. Thank you for the opportunity to fish meillant!!! We loved it!!!! We will be re-booking for next year without a doubt! We ended up with catching 45 fish with carp to 50lb and a catfish to 80lb! I would like to share my picture with my biggest fish from last year’s trip with matt Rayner, Shane baker and Daniel Secker. I saw you put up Matt Rayners picture and Shane bakers biggest fish from that week on Lake meillant. 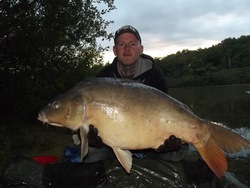 This was my pb at 40lb 2oz from that week and my best year in France. please find picture attached. To see more pictures go to the gallery. 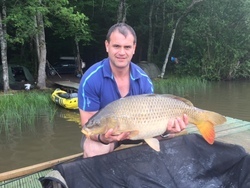 We had a great week at Meillant it is truly a beautiful lake, the bailiff Mikael is a very helpful and lovely person, please send our regards and we will look forward to seeing him in the future. Hi David, we fished lake Meillant last year and what a week we had! Thoroughly enjoyed by all ! 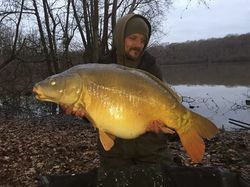 I have also attached a few photos from the week, really amazed by one cap which we name ‘one eye’ for obvious reasons, and he came out twice in the week at 46lb !!! Kind regards, Matt rayner . During a busy winter of work, I had decided that I would forego my usual new years eve celebrations and inevitable headache the following day(s) and do something a little different. I visit Lake Meillant every year and have done since Carp Fishers Abroad developed it, so I like to think I know the lake fairly well. A winter session was booked and an old college friend said he would like to come along. I had been keeping a close eye on the weather leading up to the trip, as of course it can be tricky, but this was as much of a relaxing few days by the water, rather than an all out mission to catch carp. I knew it would be very cold, so being organised was key. Staying warm and comfortable was going to be paramount, and as I was packing enough gear for both myself and my friend, I needed to pack sensibly! Four and a half hours from Calais, driving through the night, we arrived at the lake before first light, it was snowing, a cold wind was hurting my face and I was tired. Good start! Now usually I would have thrown the bivvy up and slept, but this time I wanted to make the most of the time I had here. I had the journey over to think about it, and had decided I would really try hard to catch. I had put us on the dam wall to start with, as I have caught fish here at all times of year in the past, and in the dark it’s easy to set up and get rods out with no drama. My friend Phil had set up my other bivvy and gone to sleep, but I had set up a couple of rods and cast out in the snow. Glugged single hookbaits on both. Once set up and in the warmth of my shelter, I nodded off but was interrupted by a series of liners. I always fish fairly slack lines so I let off even more to determine if the liners where close or if it would develop, an after another hour it had been silent.Thinking there were fish closer in, I recast to my right margin, it’s around 12 feet and hard, so I introduced two small handfuls of sweet corn and boilies over it and got back in to the warm. As dawn arrived I was playing a fish, very surprised to have any action already I was pleased with the low twenty in the net. The local lad that looks after the lake had turned up for his morning walk, so he took a picture for me while Phil slept, and I made a cup of tea to warm up. The water was painful to the touch, and I was eager to catch more, now I realised there were a few fish to be caught. I had kept any eye on the lake, the dam wall is a good place to start as you can see plenty of the water. I know many of the groups that fish the lake just set up camp for the week, but I have never done this as I like to get the most from each swim then move if the fish do. The following 36 hours saw two more fish out, both twenties, but I had the feeling there were bigger fish further up the lake. I had seen a few good shows and as the sun came up to warm my face, I decided we should move. We walked the lake, visiting each of the platforms. The shallow bay to the right of the dam always holds fish, as it gets less angling pressure due to the fact that it’s the furthest walk! I have had many great sessions there but we only had a couple of days left and I didn’t get the feeling the fish were there in a big way, so we opted for the other side of the lake. I set Phil up in what had always been a banker swim in the past, it’s a narrow channel leading to a culvert that goes into the top pool, which is around 3 acres. The fish can be in there in a big way, at different times of year, and you can catch them on both sides of the culvert as they pass through. I set up on the platform to the right of Phil, choosing to fish open water, and regularly recast to find fish. The area I had seen a couple of shows was a big chuck for me, but I managed to get a bait on it. I never use marker rods, and am lucky to know the lake well, so I am confident that I am getting good presentation with balanced single bottom baits. I fish three rods, on areas where the silt meets the shale, and scatter around a dozen baits around each. I was fully expecting Phil’s spots to produce if any, although the cold was really biting, so we kept warm drinking teas with a little bourbon, and eating well. I had a take after only a few hours, a mid twenty. I was buzzing now as I had previously told Phil that if we caught five fish in total we would be doing well in such weather. At this time of year size really doesn’t matter, I was just happy to have found the fish, and had justified the move already. Within another hour the other spot produced a lovely fish of just under thirty pounds. Most Meillant fish are mirrors, with few scales, whilst this one had a pretty patch on its flank, so easy to recognise in future. I was now in the zone! I have always been very serious about presentation and believe confidence is key. I absolutely despise losing fish. And from a young age I would always change things after a loss. I speak to anglers all the time who take it for granted that they will lose a percentage of hooked fish, but I think this is a bad way to think, as you don’t put as much effort into not losing fish! My hook to land ratio has always been very high, I put it down to strong balanced tackle, suitable presentations for the situation, and always learning from mistakes. I always check hook holds, always check hook points, and always make sure the bait sits exactly how I want in the water. Everyone has their own thoughts and ideas about such things, but confidence and consistency have taught me more than anything else. These long winter nights mean you have to be warm and comfortable. If you are cold and wet, you simply won’t want to be there, so it’s crucial to pack the right kit. I always have plenty of spare socks, joggers, hoodies etc, as if I am lucky enough to catch a fish, the welfare of the fish comes first of course, so even though its literally freezing you will get messy, and there’s little worse than getting back in your bag, wet and stinking of fish! New years eve started well. I was still confident in the spots as it had been a cloudy night, and kept the temperature to a cosy half a degree! That was the warmest it had been since we arrived, my Oxyguard indicated the water was 2.1 degrees. I fired out half a dozen baits around each rod, but didn’t re cast. Within a couple of hours I had a full on belter while I was stood next to the rods, to start with I thought it was a smaller fish, but as it came closer, the usual slow plod of a bigger brute revealed a great fish as it broke the surface and into the net. 45lb 3 oz on the scales, what a winter result! No snow on the ground, but the net had been frozen solid to the platform, and it took Phil five minutes to tear it from the decking, then soak it before we could land the fish! I was so happy, and knew I could have more fish. We took a quick picture, I never wander off with the fish to find the perfect spot for light etc, it’s always about the fish, and it was back in the water within two minutes, as always. It was a near leather, and a fish I hadn’t caught before. I was being rewarded for my effort. I recast all the rods, it’s worth noting that I always use glugged baits in winter. The hookbaits are glugged in a few liquids for weeks prior to fishing, and the loose feed baits are also glugged. I also dip the whole lead arrangement and rig in a thick glug made of a few liquids and fine groundbait. It looks messy, but I have always done it when fishing singles or little bait, as I say different things work for different people!. The whole trip I used less than 2 kilos of bait, whereas in the spring at the same lake I have used up to 50kg to keep the bites coming. Within another couple of hours I had a great scrap with a chunky mid thirty, then two more twenties. Each time going through the same procedure, and each time being rewarded. I had decided that I would introduce a little more bait before dark that night. I caught fish at 11.30pm and 1.30am new year’s day. I then went back to sleep. “don’t get out of bed mate!” said a cold looking Phil as he peered through the letterbox gap in my shelter. As I peered out I saw the whole lake frozen and was a bit deflated. I had really expected the day to produce more fish but it was thick ice. It had gone from being ice free at 1.30am to completely frozen at 10am! That’s cold. We decided to pack up after that , we had kept warm and dry, had a great laugh, fished hard and caught a dozen nice fish, all whilst the weather was less than kind. I have caught loads of fish in most months at Meillant, I love the place. 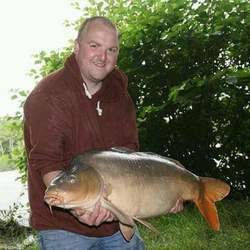 I have had numerous fifty pound fish from the lake in the past, and loads of forties. I will definitely fish it again next winter, just use common sense, keep an eye on the weather the weeks leading up to it, and put in the effort if you want to catch! Bait was DNA and CC Moore boilies, BP milling cereal pellets, sweetcorn. 4oz leads, heavy tubing, reverse combi popup rig ACE hooks. ACE longshank for balanced bottom baits. and most other fish high twenties and thirties plus 3 small sturgeon and lost a couple of monster catfish which are great fun at night!! Our season is pretty much finished now, with few anglers braving the winter to fish at either Chalet Lake or Meillant. I am pretty sure that you would struggle at Chalet Lake which doesn’t fish well in the cold but I would be interested to know how Meillant would fish particularly as the climate is generally milder and the water much deeper. Any takers? We have just returned from the Lakes and have introduced another hundred odd fish mostly between 18-23lbs to each lake. This is the second year running we have made such a stocking at Chalet Lake and the third at Meillant so the numbers should be getting quite serious now. If they grow anything last the lot then we can look forward to some cracking sport next season. David Scott asked if I could send over a few of pictures of some of the fish that I caught on our trip we had a couple of weeks ago, I’ll only send a few as there are so many and I don’t want to over load you. I believe David has given you numbers of fish for us which are quite staggering, I personally had 104 runs and landed 72 fish and never fished nights or tea time! 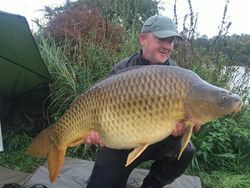 Mike Simpson runs a small business called Carptrek and takes a number of weeks from us each year to take escorted parties to fish our lakes in France. He has one space left on his team to fish the week of 1st November this year at Chalet Lake when the fish are feeding hard prior to winter. If you are interested in joining Mike please contact him directly. He is a properly nice chap!